What a weird premise for a movie. So, in this movie, Elvis Presley (Bruce Campbell) changes places with an Elvis impersonator to get away from the limelight and the craziness of the life as Elvis. However, the real Elvis falls and winds up in a coma. When he comes to, he finds himself in an East Texas rest home and discovers that “Elvis” had died. With several other physical problems, Elvis found himself struggling to find the positive parts of life. Instead, he lamented for what he had lost and where he was. However, Elvis becomes friendly with a man at the rest home who believes he is President Kennedy (Ossie Davis). Making things even stranger, they discover that there is an ancient Egyptian mummy that is staying alive by sucking the souls of the residents of the rest home out through their butts. And despite that oddball premise, this movie is fantastic. It might be a ridiculous set-up, but the performance from Bruce Campbell as Elvis is simply amazing. It is the best work I have seen from Bruce Campbell. Elvis is soulful and reflective and the film clearly cares about the character of Elvis. He is also funny as he has the typical Bruce Campbell wit. This was quite a surprise The film had no reason to be as good as it was, but I enjoyed it a ton. It was a great combination of horror/comedy/drama/thriller. Ossie Davis was compelling as Jack and one almost believed that he truly was President Kennedy died black. There was also Kemosabe (Larry Pennell), a man at the rest home with a mask and toy guns who was clearly meant to be the Lone Ranger. 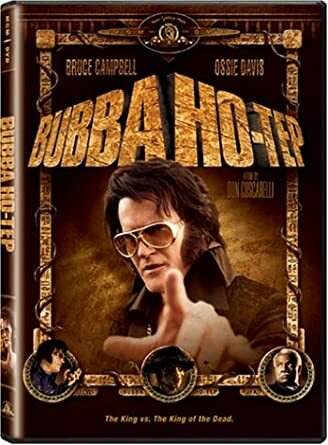 Based on the Bram Stoker Award nominee short story by cult author Joe R. Lansdale, Bubba Ho-Tep was directed and written Don Coscarelli. I found it on Amazon Prime tonight and I am very happy I took a chance on it.